A true workhorse, The BigRig is a tandem 4-wheel bicycle with an electric-assist motor that runs off two car style, marine grade batteries. 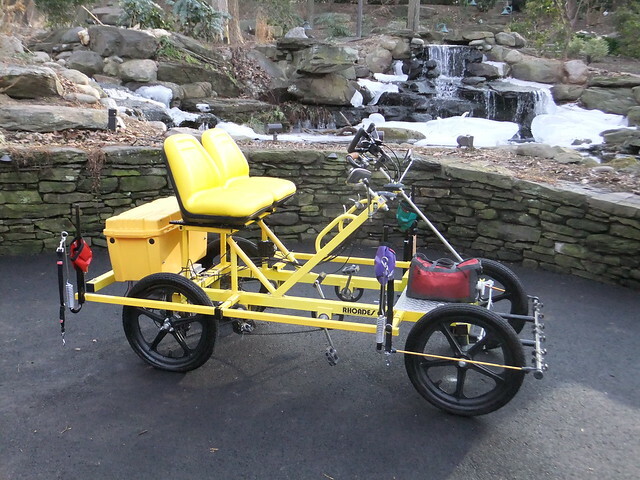 The motor is capable of pulling the whole load with minimal pedaling, and the riders can simultaneously or independently pedal. The motor helps train the dogs to run and alleviates the load. The BigRig has both regular and hydraulic brakes and also has three different parking brakes to prevent the dogs from pulling it when stopped. A Sacco Cart style pull bar is mounted on the front end so it can be pulled by three dogs side by side, and U-Shaped dog attachments, called Springers, are attached to the sides. The bike is equipped with a cooler and battery operated pump-driven misting system, designed by Bill, to help regulate the dogs’ temperatures, and an easily-attached canopy to shelter the riders. Previous Previous post: What’s that thing the WooFDriver is riding?